Because the noble act of shaving is a timeless thing and after a while you will get tired of the Miami Vice stubble anyway, why not try your hand at the gentlemanliest style of shaving with this classic starter kit? Razor, not a cheap plastic toy but a hefty, proper stainless steel one. Classic model. Two packages of different blades, 5 blades in each box. 40 grams of shaving soap, handmade in Finland. 20 aluna sticks. 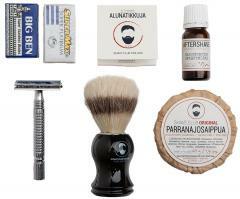 These are used to treat any little cuts you might manage to have while shaving. Take a stick out of the package, wet its head and rub on the wound. Discard the used stick. Stop using if you get any side effects. A 10 ml glass bottle of odourless aftershave (100% witch hazel). Let the shaving brush soak a while in hot water. Soften your beard in warm shower or with pre-shave. Shake the water off the brush and load it with soap. Foam up the soap in a bowl and spread it on your face. While holding your skin taut, start shaving with short strokes. Don't press the razor against your skin. Repeat if necessary, shaving in different directions. Wash your face with cold water and use aftershave. 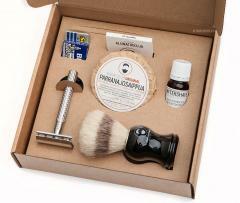 A man needs rituals and what's better than a proper good old shave? This set also makes for an excellent gift idea. 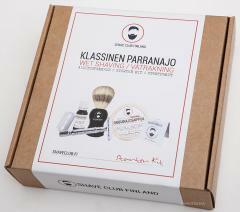 Shave Club Finland is, as the name suggest, dedicated to the manly art of shaving, you know you're getting quality here. Not sold abroad, as these may have "dangerous and forbidden" liquids! - loistava paketti aloittelijalle, sopien varmasti kokeneillekin. - silti luulen tään pidemmässä juoksussa tuleven halvemmaksi, kuin päivittää sähkökoneitten ajopäitä yms.